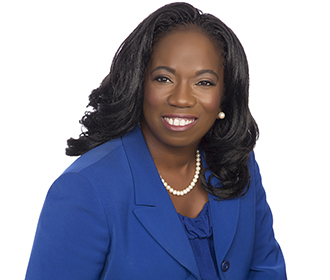 Gwen Keyes Fleming has more than twenty years of public sector experience, having served as both an elected and appointed official at the state and local levels, as well as in various branches of the federal government. Most recently, she served as the Principal Legal Advisor (General Counsel) for Immigration & Customs Enforcement (ICE) in the U.S. Department of Homeland Security (DHS), and as Chief of Staff to the Environmental Protection Agency (EPA) during the Obama Administration. In addition to her time at the DHS and EPA, Gwen served as the EPA Region 4 (Southeastern Region) Regional Administrator, where she was responsible for establishing and implementing environmental policy for eight southeastern states and six federally recognized tribes. Gwen was twice elected District Attorney for the Stone Mountain Judicial Circuit in DeKalb County, Georgia; the first African-American and first woman to hold that office. Gwen’s practice at Van Ness Feldman focuses on environmental policy, enforcement defense litigation, and special investigations for private as well as municipal clients. She also provides strategic advice and counsel on national security matters related to the protection of environmental and energy infrastructure from cyber and physical threats, including compliance planning, incident response and subsequent enforcement or litigation matters. She is coordinating the firm’s practice in the area of cybersecurity and is the co-author of "Critical Infrastructure: 2018 Cybersecurity Year in Review/2019 Year Ahead Analysis" and "Federal Government Takes Steps to Shape Rules for Automated Vehicles." She has also served as a speaker on the issues relating to critical infrastructure cybersecurity. Gwen’s strength in building relationships, managing complex matters, and in-depth knowledge of local, state and federal governments, helps clients achieve their business imperatives. Assisted newly elected local government client with reviewing terms of Clean Water Act Consent Decree, drafting a plan to address previous performance challenges with staff responsible for compliance and outlining a strategy to engage the regulatory agencies going forward. Conducted internal investigation into alleged employee violations of organization’s policies and procedures that resulted in employee agreeing to repay funds inappropriately obtained. Led the largest legal program within DHS, comprised of approximately 1500 attorneys and staff in 60 locations across the country providing legal advice to ICE client senior officials as they led a global team of nearly 20,000 employees committed to protecting national security and public safety via the enforcement of immigration and customs law. Managed day‐to‐day operations of EPA’s nearly $8B budget and 15,000 employees in concert with other senior agency officials. Participated in the development and coordination of viewpoints of various stakeholders as the Agency finalized or proposed significant environmental regulations including the Clean Water Rule, the Clean Power Plan, the Definition of Solid Waste (DSW) Rule, Coal Combustion Residuals (CCR) Rule, Ozone NAAQS and the Worker Protection Standard. Operated as the lead enforcement official responsible for coordinating all civil and criminal aspects of environmental protection in conjunction with state partners and headquarters representatives in accordance with the statutory provisions of the Clean Water Act (CWA), Clean Air Act (CAA), Comprehensive Environmental Response, Compensation, and Liability Act (CERCLA), Resource Conservation and Recovery Act, (RCRA) National Environmental Policy Act (NEPA), and other environmental laws. Served as the chief negotiator on numerous highly sensitive and complex environmental matters involving diverse stakeholder interests including a comprehensive and enforceable historic agreement with the State of Florida establishing for the first time a science-based protective limit (WQBEL) on NPDES permits controlling phosphorus pollution discharges into the Everglades thereby ending nearly twenty years of litigation. Served as the Agency’s co-representative to the RESTORE Act Council and supervised the personnel tasked with addressing ecosystem restoration and community resiliency in the Gulf of Mexico coastal region after the Deepwater Horizon Oil Spill. Managed to fairly balance the interests of law enforcement agencies, next-of-kin, the media, and the community-at-large during the initiation and supervision of a year-long Special Civil Grand Jury Investigation into fifteen (15) officer-involved fatalities that occurred within DeKalb County, GA within the span of one year. Maintained Top Secret/Sensitive Compartmented Information (TS/SCI) Clearance.